The Butterfly Evolutionary Diversity (BED) project is a three-year project between the South African National Biodiversity Institute (SANBI) and LepSoc. The BED project seeks to map patterns of evolutionary diversity for butterflies across South African landscapes. This is an exciting research project and aims to identify areas not only of high butterfly species richness and conservation concern, but also areas of high evolutionary importance. What the BED project aims to do is to bring together the distributional data from the butterfly atlas project with phylogenetic data to be able to map, across South Africa, the patterns of evolutionary diversity. In order to do this, DNA material needs to be collected for as many different South African butterfly taxa as possible in order to build the needed phylogenetic trees. Professor Rauri Bowie (Department of Integrative Biology, University of California, Berkeley) will be undertaking the genetic sequencing and building the needed trees. From these trees, evolutionary diversity will be calculated using various metrics of phylogenetic diversity. Using the expertise and workforce of LepSoc, together with SANBI and international scientists, we have the unique opportunity to take butterfly biodiversity data to another level and identify areas not only of high species richness, but also of high evolutionary importance. 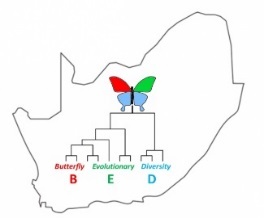 As a first step, the BED project aims over the next year to collect representatives of as many different South African butterfly genera as possible to build a genus-level tree. Initially, for each genus, a target of 1-5 species per genus and 1-3 specimens per species is aimed for, with as wide as possible geographic sampling across South Africa. Our long-term goal, however, is to try and collect DNA material for as many South African butterfly taxa as possible so that we can build complete species-level trees. Although quite a bit of DNA material has already been collected for other butterfly projects by LepSoc members in the past, particularly for the Lycaenidae, a recent search of GenBank has shown that much South African material is still to be collected, and new material is also needed to get the full complement of genes required to build robust trees. Provincial Leaders (PL) in each province that are currently involved in the SALCA project will be used to disperse vials, preservative, and envelopes to local members, and to help coordinate posting and collection of material. Local members can also request vials and preservative directly from Jonathan. All costs for postage, envelopes, preservatives, and vials will be covered by the project. Once the project has started and members are collecting, we will send out regular lists via email updating members what has been collected, what still needs targeting, and what has already been collected sufficiently so that we can avoid, as best as possible, duplication of collecting. Taxa of high conservation concern - Endangered or Critically Endangered, will not be targeted in the initial stages of the project, unless these represent the only members of a genus, then a decision will be made with advice from the SALCA project. South Africa is one of the leading countries in the World for atlassing projects, red list assessments, and mapping areas of important biodiversity. Butterflies have become a focal group for this and are leading the way in developing new techniques. Using the expertise and workforce of LepSoc, together with SANBI and international scientists, we now have the unique opportunity to take biodiversity data to another level and identify areas not only of high species richness and conservation concern, but also of high evolutionary importance and interest. South Africa will be one of the first countries globally to undertake a project mapping its butterfly evolutionary diversity. Further, in time we will be able to compare the results of the BED project with other groups of organisms (e.g. plants, birds, reptiles) to seek general hotspots of evolutionary diversity. It is also hoped that results of the BED project will feed into the 2018/2019 South African National Biodiversity Assessment coordinated by SANBI. This is an important five-yearly national assessment of South Africa’s biodiversity and conservation goals. All those interested in wanting to be involved, please contact Jonathan and/or your local Provincial Leader to obtain a list of detailed instructions for collecting DNA material, and where you can obtain vials and preservative. See the “contacts” tab for contact details for Jonathan and your local PL. We encourage all members to become involved and we very much look forward to working with LepSoc on this project!